While ethnographers’ work with American Indians and Native Alaskans continues, in recent years, NPS Regional and Park Ethnographers as well as ethnographers from the Washington Office (WASO) increasingly have turned their attention to facilitating communication and consultation between parks and other culturally diverse groups in American society. Using applied anthropology, ethnographers work to enhance public appreciation of the cultural diversity preserved in urban and rural areas among African Americans, Hispanic Americans, Latinos, and occupational groups such as fishermen and artists (Mueller 2001; King & York 2001; Peña 2001; Vasquez 2001; Smythe 2004). Walnut Grove Chinese American Historic District, nominated to the National Register 1990. Involving and educating the public. To these ends, ethnographers provide technical assistance that assists the Park Service in planning, management, training, and education activities designed to meet legislated requirements in respect to historic and heritage preservation. The Park Ethnography Program reviews general management plans, environmental impact statements, and special resource studies to offer management recommendations for integration of ethnographic information into park plans. Ethnographers participate on interdisciplinary Park Service groups planning and conducting studies to determine if a resource should become part of the National Park System. Congressional decisions about establishing new units might entail early ethnographic attention to people and resources. The Fort King Special Resource Study, currently in progress, consulted Park Ethnography for input about African American people associated with Fort King and with Florida landscapes near the Fort that might be culturally significant to African Americans. African American Heritage and Ethnography, in particular this section “Heritage Preservation Notes,” is an educational resource provided by the Park Ethnography Program for the park service workforce as well as the public as a tool that may be used to assist in the Park Service in meeting the various legislated requirements of the NHPA and NEPA. 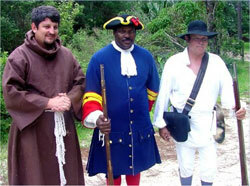 African Americans, Latinos and Hispanic Americans, and Resources in the National Park Service: A Workshop for Park Managers, Interpreters, and Cultural Resource Specialists, 2000. 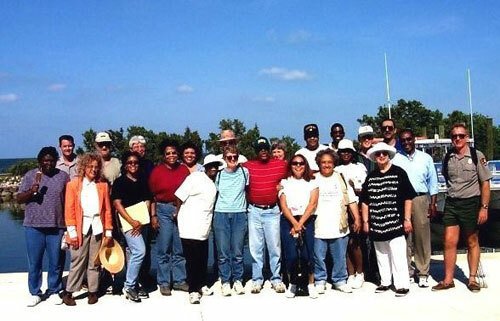 Group Picture, “African Americans, Latinos and Hispanic Americans and Resources in the National Park Service Workshop” May 2000, Miami, Florida. Ethnographers also provide background heritage and ethnographic information for development of interpretive programs. Using ethnographic research reports, interpreters develop overarching themes that bring coherence to various elements of cultural meaning that park resources may have for diverse public groups (Brown 2000a:15). In all of these kinds of activities where ethnographers, NPS workforce, and the public met and dialoged, some issues surfaced repeatedly. They mostly revolved around the question of ownership of “heritage” and the changing publics served by the Park Service as the American population becomes ever more diverse. Ethnography and Interpretation are both disciplines in the National Park Service that seek to understand and explain the cultural meanings which heritage, historic, and natural resources found in parks have for living people associated with a park. These people may be park neighbors, park visitors, and others who are park stakeholders. The fact that different cultural groups may attribute different meanings to the same resources makes the tasks of understanding and explaining them even more complex. “Whose Heritage Is It?” is a question raised in one form or another when ethnographers interface with the public in workshops and other venues. It is a question about how and by whom should American heritage should be described, commemorated, and interpreted (Chambers 2005). The issue of “Whose Heritage is it?” and “How should it be interpreted?” is made even more complex by the multiple ways in which people identify themselves. People not only make up groups that identify themselves differently from other groups but there are also within group differences in the way that group members identify themselves. People identify themselves in more than one way. They may see themselves as southerners, Texans, or New Yorkers. A New Yorker may also describe herself as Latina, African American, or Irish American. Some people in a group may identify around their use of a common language like Hispanics, Cajuns, Hopi, or the Lakota-Sioux. Other people self-identify around occupation such as ironworkers and whalers, while for others the common bond is an historical association like the Sons of the Confederacy, the Daughters of the American Revolution or Civil War Reenactors. It is possible for one person to identify herself as a northern, African American, nurse who is a member of the Daughters of the American Revolution, as in fact did one woman interviewed by an ethnographer. These variously self-described people make up the Park Service public who may attribute different cultural meanings to resources managed by national parks and usually have different perspectives on American history and how it should be presented. Since its beginnings the Park Service endeavored to preserve cultural and natural resources and the heritage of Americans, however in recent years there has been an increased emphasis on the diversity of cultural groups making up our society. “Diversity is no longer just sound public policy; it has evolved into a strategic imperative for the long-term survival of the National Park System. Diversity means inclusion, valuing, respecting and appreciating the differences in race, gender, national origin, disabilities, age, religion, and/or sexual orientation. Diversity is holistic; it embraces the business, cultural, natural, historic and demographic dimensions of this organization. The National Park System represents the contributions of the grand diversity of America and belongs to all citizens of this Nation and all have a stake in its long-term preservation” (Murphy 2000) April 2005. Toward this end the Park Service must demonstrate and improve the proactive leadership in the management of workforce diversity through the articulation of a common vision, clear, focused on goals, active participation and achievement of results. The Service will work more aggressively toward increasing the diversity in the visitors to our sites by telling the whole story in our interpretative themes and programs. We will improve our educational and informational materials by respecting diverse cultures and different languages; Diversity is a mission goal of the National Park Service (NPS 2005). In the coming year HPN will provide interactivity experiences allowing participants to uncover the location and connections to parks, people, cultural resources, and ethnographic resources related to the life and culture of Africans and African Americans in the colonial period.